I spent my day yesterday playing around with some natural dyes I’ve collected, and dye mediums. I practiced printing designs with my ʻohe kāpala (bamboo stamps). This is one of my practice pieces done on watercolor paper with kukui nut ashes (grey) and ʻalaea (red). I used kukui nut oil mixed with water as the medium for the ‘alaea. It made a good consistency that enabled the pigment to be both dark enough and fluid enough for printing. The kukui ash did not work well with oil and/or water. I ended up using it dry and applied it using a small piece of kapa as a brush. 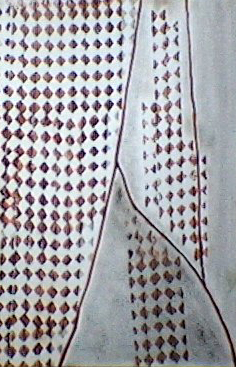 This method of “dry painting” with a tapa brush was noted by Te Rangi Hiroa (Peter H. Buck) who was a director at the Bishop Museum from 1936 until he died in 1951. Among his many achievements, Buck wrote a series of scholarly publications entitled “Arts and Crafts of Hawaii” (1964) in which he wrote on various subjects of Hawaiian cultural life. Clothing, was one of the sections and it includes a pretty thorough discussion of Hawaiian kapa history, tools, and processes. Some other sections in the Arts and Crafts of Hawai’i series are food, houses, canoes, fishing religion, war and weapons, death and burial, and more. Ka Hana Kapa: The Making of Hawaiian Kapa, Memoirs of the Bernice Pauahi Bishop Museum of Polynesian Ethnology and National History. Honolulu, Hawai’i: Bishop Museum Press, 1911. This is authentic! I found this online and it is free to read! Then I saw an actual copy at the Kaua’i Historical Society when I visited their resource library! It was great to see it, a very large, over-sized book filed with knowledge I can use! Mahalo ke Akua!